Kodumudi: "We believe that the Indian market will be one of the largest by the end of this decade." 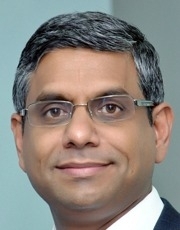 Mahesh Kodumudi took over as head of Volkswagen's group operations in India in February 2014 at a time when the company's sales were sinking fast. Last year deliveries to customers declined 19 percent to about 92,500 cars, contracting more than twice as fast as overall demand in the country. Volumes sank a further 34 percent in the first half of 2014, this time falling at a rate 10 times worse than India's car market. Part of the problem is VW's product lineup, above all the lack of a sedan or SUV shorter than 4 meters and equipped with a 1.5-liter diesel, models which enjoy strong customer demand as well as the most preferential tax treatment in India. Kodumudi plans to boost localization at VW's Pune plant to 90 percent from about 70 percent now, which will help the automaker lower those models’ starting price in the market. VW also expects a boost from the recent decision to begin local assembly of 1.5-liter diesel engines before year-end. In July, VW began offering a diesel in that displacement class in the Polo hatchback, but the car is hit with heavy import duties because it is shipped to India from Poland. Additionally the 49-year-old manager needs to expand the carmaker’s range to offer a Polo-sized car in either a sedan or SUV body style, which are the fastest-growing niches in the market. Greater sales volumes in India would reduce the need for Pune to manufacture cars for export to maintain an acceptable level of utilization at the plant, where VW can build 130,000 vehicle annually in its current two-shift operation. This year roughly half of Pune’s output is destined for overseas customers, mainly Vento sedans for Mexico. Kodumudi answered questions provided to him via e-mail by Automotive News Europe Germany Correspondent Christiaan Hetzner. Has the Volkswagen brand lowered its targets for the Indian market? If so what are they now and what were they before? At Volkswagen we believe that the Indian market will be one of the largest by the end of this decade. It is our intent to be a world leader in the automotive industry and we want to be a significant player in the Indian market too. However, our focus is not on mere market share. We want to ensure that our products meet the highest levels of quality, safety and technology. To enhance our presence in Indian market, we would need a wider portfolio of products. As far as the targets are concerned, we know that the brand can achieve 10 percent segment share in the segments that we are playing. Is VW profitable in India? Volkswagen India is a profitable business. The utilization rate of the Pune plant is currently running at around 75 percent. As demand in the domestic and export markets increase, we can ramp up our volumes by operating a three-shift system [up from two shifts now]. Was the VW brand at a disadvantage since it effectively competed with Skoda in the market, given both are positioned at the premium end of the market? Did the lack of sub-4 meter cars hurt sales? Volkswagen and Skoda are well-positioned brands in India. With their respective product portfolios, the brands reach out to their defined customer groups. In the last couple of years the Indian automotive market saw a shift to sub-4-meter cars and SUVs. Volkswagen is considering options for new models in these segments, but no decisions have taken so far. With the recently launched new Polo, the Volkswagen brand in India introduced the 1.5 TDI high-performance [diesel] engine, which is specially designed and developed for India. This engine has gotten a very positive response from the Indian customers. It also underscores the importance of the Indian market for Volkswagen and the focus the company has on the customers’ needs. Analysts believe Volkswagen also had problems delivering the necessary service and aftersales experience customers expected for a German brand like Volkswagen, is that true? With only four to five years in the market, Volkswagen is still a relatively young brand in India [volume production of the Polo at the Pune plant started in later 2009] and it takes time to settle in a challenging automotive market like India. This also included a very fast built up of the Volkswagen dealer network in India from less than 10 to more than 120 dealers within just three years. In some cases, single dealers will have not been able to meet the high demands of Volkswagen customers, however, we are making good progress on our way to develop the best sales and service organization in India. MAIN CHALLENGE: Increasing localization content for VW's Pune plant, persuading headquarters to OK at least one new model shorter than 4 meters, either a sedan or an SUV like the Taigun concept shown earlier this year at the Delhi auto show. How much has Volkswagen as a group invested in India? I understand another 200 million euros has been earmarked for engine production and other projects? Volkswagen India invested 580 million euros initially and subsequently another 100 million euros. We are considering various actions including expanding and deepening our localization, introduction of new variants and models, etc. All these will require investments that we estimate would add up to about 1,500 crore [about 190 million euros] over the next five years. The investment in an engine assembly line is part of the total investment we have announced earlier. When do you expect a final approval to build the sub-4 meter Taigun SUV or equivalent-sized sedan? The first step of this investment is for the engine and engine assembly line, and that has already been announced. New models are under consideration and no decisions have been reached. Do you believe the Modi government will help lift demand and do you see the extension of the excise duty cut? The new government of Prime Minister Modi has brought back a lot of positive sentiment to the Indian economy including the automotive industry. With the extension of the excise duty cut, the government sent out a positive signal to the economy. The last three months have seen a positive growth in sales compared with the year before. We wish to see the excise duty cut extended beyond 2014. The promised implementation of the Goods and Services Tax (GST), for example, will give the market an additional boost for sustained growth and will help increase consumption. The more realistic transfer-pricing benchmarking and the views on retrospective taxation announced in the new budget would definitely go a long way toward attracting more investments. Further, the major emphasis on infrastructure developments and improvements in roads, ports, railways and power will reduce the cost of doing business and improve the industry competitiveness and positively boost exports.